Flat bottom tools, or tools with flat bottom geometry, are useful in a variety of a situations and operations that tools with typical cutting geometry are not. The standard characteristics of drills or end mills are useful for their primary functions, but make them unsuitable for certain purposes. When used correctly, the following flat bottom tools can make the difference between botched jobs and perfect parts. Flat bottom drills are perfect for tricky drilling situations or for creating flat bottom holes without secondary finishing passes. Consider using these specialized drills for the operations below. When drilling through holes in thin plates, pointed drills are likely to push some material out the exit hole and create underside burrs. Flat bottom drills are significantly less likely to experience this problem, as their flat bottom geometry generates more even downward forces. When drilling a hole that crosses the path of another hole, it is important to avoid creating burrs, since they can be extremely difficult to remove in this kind of cross section. 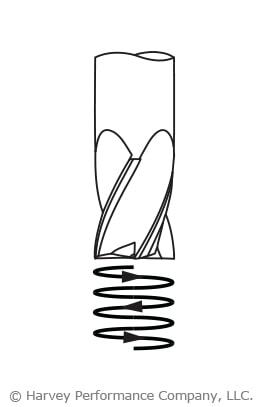 Unlike drills with points, flat bottom drills are designed to not create burrs on the other side of through holes. 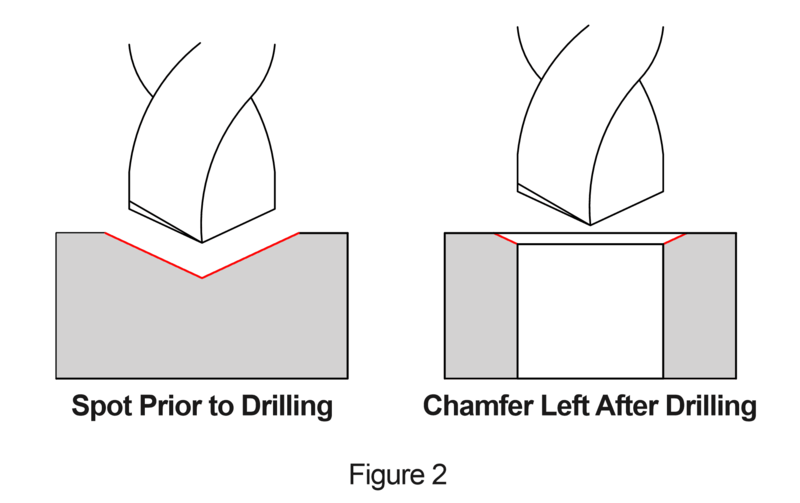 Flat bottom drills initially engage irregular surfaces with their outer edge. Compared to making first contact with a standard drill point, this makes them less susceptible to deflection or “walking” on inclined surfaces, and more capable of drilling straighter holes. 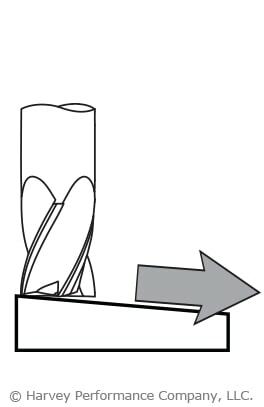 Even if the surface of a part is flat or regular, a pointed drill is susceptible to walking if it engages the part at an angle, known as angled or tilted drilling. For the same reason flat bottom drills are ideal for drilling on irregular surfaces, they are perfect for angled drilling. When drilling a half hole on the edge of a part, the lack of material on either side of the drill makes the operation unstable In this situation, a pointed drill is susceptible to walking. A flat bottom drill makes contact with its entire cutting geometry, allowing for more versatility and stability when drilling half holes. Flat bottom counterbores are an excellent choice when a flat bottom hole is needed and a tool without flat bottom geometry was used to create it. Keep some of these tools on hand to be prepared for the operations below. Drill geometry is designed first and foremost for factors like stability, rigidity, and chip evacuation. Some holes will need secondary finishing operations. Flat bottom counterbores are often designed with a slow helix and low rake, which help them avoid part engagement and control finish. Even experienced machinists may drill a less-than-perfectly-straight hole or two in new and unfamiliar jobs. Fortunately, flat bottom counterbores are well-suited for straightening misaligned holes. The unique geometry of flat bottom counterbores makes them effective at spotting on irregular surfaces. Standard drills and spot drills are susceptible to walking on these kinds of surfaces, which can potentially ruin an operation. When a standard drill creates a hole (other than a through hole) it leaves a “drill point” at the bottom due to its pointed geometry. This is fine for some holes, but holes in need of a flat bottom will need a secondary operation from a flat bottom counterbore to remove the drill point. The dish angle present on most standard end mills allows proper end cutting characteristics and reduces full diameter contact. However, these end mills will naturally leave a small dish at the bottom of a hole created by a plunging operation. As with drill points, flat bottom counterbores are perfect to even out the bottom of a hole. Tool entry is pivotal to machining success, as it’s one of the most punishing operations for a cutter. Entering a part in a way that’s not ideal for the tool or operation could lead to a damaged part or exhausted shop resources. Below, we’ll explore the most common part entry methods, as well as tips for how to perform them successfully. 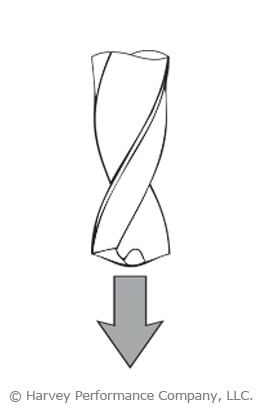 Pre-drilling a hole to full pocket depth (and 5-10% larger than the end mill diameter) is the safest practice of dropping your end mill into a pocket. This method ensures the least amount of end work abuse and premature tool wear. Helical Interpolation is a very common and safe practice of tool entry with ferrous materials. Employing corner radius end mills during this operation will decrease tool wear and lessen corner breakdown. With this method, use a programmed helix diameter of greater than 110-120% of the cutter diameter. This type of operation can be very successful, but institutes many different torsional forces the cutter must withstand. A strong core is key for this method, as is room for proper chip evacuation. 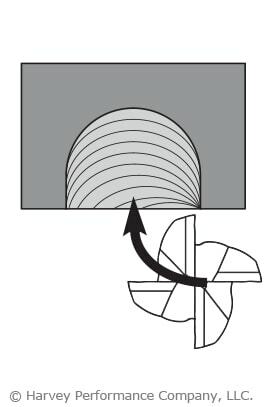 Using tools with a corner radius, which strengthen its cutting portion, will help. For more information on this popular tool entry method, see Ramping to Success. This method of tool entry is similar to ramping in both method and benefit. However, while ramping enters the part from the top, arcing does so from the side. The end mill follows a curved tool path, or arc, when milling, this gradually increasing the load on the tool as it enters the part. Additionally, the load put on the tool decreases as it exits the part, helping to avoid shock loading and tool breakage. This is a common, yet often problematic method of entering a part. A straight plunge into a part can easily lead to tool breakage. If opting for this machining method, however, certain criteria must be met for best chances of machining success. The tool must be center cutting, as end milling incorporates a flat entry point making chip evacuation extremely difficult. Drill bits are intended for straight plunging, however, and should be used for this type of operation. Straight entry into the part takes a toll on the cutter, as does a straight plunge. Until the cutter is fully engaged, the feed rate upon entry is recommended to be reduced by at least 50% during this operation. Rolling into the cut ensures a cutter to work its way to full engagement and naturally acquire proper chip thickness. The feed rate in this scenario should be reduced by 50%. Harvey Tool’s Miniature High Performance Composite Drills are specifically designed with point geometry optimized for the unique properties of composite materials. Our Double Angle style is engineered to overcome common problems in layered composites and our Brad Point style is built to avoid the issues frequently experienced in fibrous composites. Drilling an ultra-precise hole can be tough. Material behavior, surface irregularities, and drill point geometry can all be factors leading to inaccurate holes. A Spot Drill, if used properly, will eliminate the chance of drill walking and will help to ensure a more accurate final product. 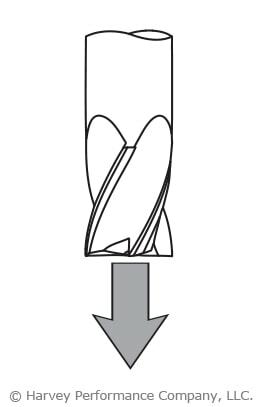 Ideally, the center of a carbide drill should always be the first point to contact your part. Therefore, a spotting drill should have a slightly larger point angle than that of your drill. 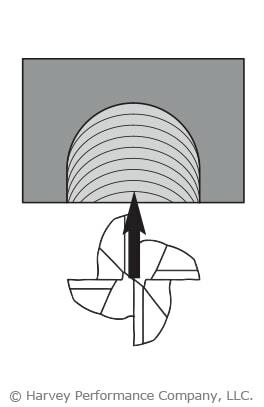 If a spotting drill with a smaller point angle than your drill is used, your drill may be damaged due to shock loading when the outer portion of its cutting surface contacts the workpiece before the center. Using a spot drill angle equal to the drill angle is also an acceptable situation. Figure 1 illustrates the desired effect. On the left, a drill is entering a previously drilled spot with a slightly larger angle than its point. On the right, a drill is approaching a spot with an angle that is far too small for its point. A Spotting Drill’s purpose is to create a small divot to correctly locate the center of a drill when initiating a plunge. 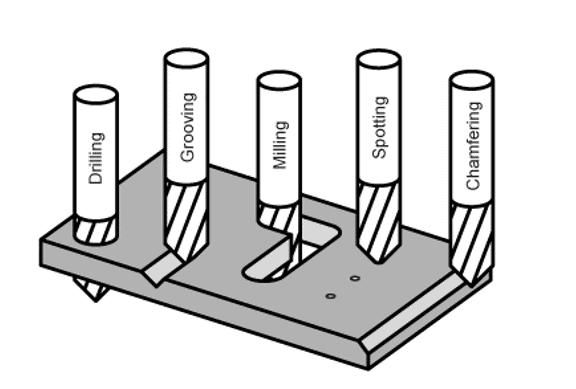 However, some machinists choose to use Spotting Drills for a different reason – using it to chamfer the top of drilled holes. By leaving a chamfer, screw heads sit flush with the part once inserted. What Happens if I Use a Spot Drill with an Improper Angle? Using a larger angle spot drill will allow the drill to find the correct location by guiding the tip of the drill to the center. If the outer diameter of a carbide drill were to contact the workpiece first, the tool could chip. This would damage the workpiece and result in a defective tool. If the two flutes of the drill were slightly different from one another, one could come into contact before the other. This could lead to an inaccurate hole, and even counteract the purpose of spot drilling in the first place. When Won’t a Spot Drill Work for My Application? 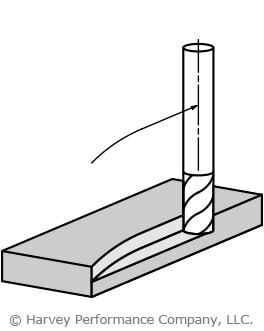 When drilling into an extremely irregular surface, such as the side of a cylinder or an inclined plane, a spot drill may not be sufficient to keep holes in the correct position. For these applications, flat bottom drills or Flat Bottom Counterbores may be needed to creating accurate features.